Move over, Mahabs and Pondicherry. We suggest five unusual locations that are not too far from Chennai and are perfect for a weekend. So, what are you waiting for? Pack your bags and discover them! Oh, and you can do your fave activities there, too. Namma Chennai is not all about beaches! Just 100 km from the city, you can find this small range of hills with perennial, deep blue streams wafting through. You can hike or trek anywhere between 3 hours and 3 days! First-time trekkers, this place is perfect for you to test waters. Start from Chennai around 4 AM and drive towards the base of the trek, which is in a village called Aree on the Pitchatur – Kalahasti road just beyond the border. 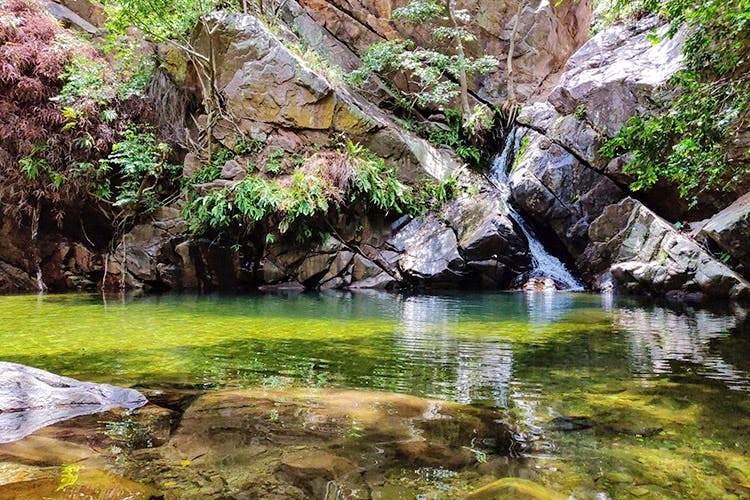 Professional trekkers can trek up to the third level, a deep blue pool, and a waterfall. All the pools are deep with the last one reaching at least 40 feet. Tip: The journey involves 4 hours of trekking through open ground, forests, and boulders. Go with guides if you don’t want to get lost in the jungle. Take life jackets if you’re not a swimmer. Horsley Hills, just four hours away, in Andhra Pradesh, has beautiful mountains around the hill top where you can have a cute picnic, relax, or walk around with bae. Doing a solo trip? Explore the wildlife sanctuary (Koundinya Wildlife Sanctuary and an elephant reserve) and Thimmamma Marrimaanu, the world's biggest Banyan tree, spread over 11 acres in the area adjacent to the hills. If you’re looking to spend a night there, you can choose from some quaint hilltop resorts as well. On a budget? Camp out on one of the flat rocks - you could stargaze or catch the sunrise the next morning. For the adventurous peeps, there is a park close by where you can try Burma Bridge, ATV rides, and short zip lining among other things. Pro Tip: Avoid the Reserve Forest you find when you climb uphill because you need permission to get in! Just 60 km beyond Thiruvallur and 10 km ahead of Poondi (home to the Poondi reservoir) lies a small hillock with some caves. Gudiyam Caves, an archaeological marvel in the Allikudi forest range is deserted and perfect for an isolated getaway. From the last stop on the road, you can trek for 4 km and find the caves. The trek can be a bit exhausting on a warm day, but it sure beats sweating in the city limits! Once on top, you will find a huge open cave which is believed to have hosted a Palaeolithic settlement between 10,00,000 and 12,000 years ago. This is a site of great archaeological importance, pointing to the existence of civilisation in this region. Lots of tools discovered from the era are now in museums. History nuts, trek back in time and get those prehistoric juices running this weekend! Pro Tip: There are only a few villagers to provide directions and the route can be tricky. So, try to go with a group on your first time! Watch out for beehives, as there are many around here. Sri City is an integrated business township in the Andhra Pradesh border near Tada. The township is a host to many MNCs with great infrastructure. Located 55 km from Chennai, Sri City is a great weekend destination for you to relax and rejuvenate. This place was once a barren forest, but has now been converted into an oasis with lakes, plantations, planned forests, resorts and trails to explore! Go camping, kayaking, walking or cycling or simply get lost in the rustic virgin forest trails. Head out early in the morning to climb the Tada Waterfalls and do some bird watching at the Nelapattu Bird sanctuary near Sriharikota. Pro Tip: Lots of residents are here, so make sure you don't venture into unknown spaces. Located near Vellore, Jawadhu Hills is a 4-hour drive from Chennai. These hills are part of the Eastern Ghats range, a serene, not too popular place for the weekend. With a canopy of trees over it, the road to Jawadhu is nothing short of amazing. If you’re fond of biking, this is a great place to ride to! Just 60 km from Vellore is the small town of Jamunamarathur, the base for the hills. The drive involves a 30+ KMs section through a dense forest. Even on a bright day in summer, the temperatures inside the forest are at least 10 degrees lower. You can also trek in these hills with the help of local guides. Forest trails and dreamy landscapes, this place is a haven for nature lovers. There are a couple of waterfalls in these hills (Amrithi falls and Bheema falls) which flow heavily during monsoon (September to December). Astronomy addicts, Jawadhu hills has been touted as one of the best places for stargazing and has the least light pollution. Also, Kavalur ISRO observatory is situated on top of a small hill, and if you get permission you can stargaze through their massive telescope! Either way, you can get tucked into your warm blankie and watch the universe! Pro Tip: Go in groups, it may not be safe to travel alone.